Note: While the Occupy Vancouver camp was set up on the lawn and plaza of the Vancouver Art Gallery downtown, I visited frequently. I wanted to write something about this event, but I wanted it to be something different from what everybody else was saying; a fresh angle. A friend in my writer’s workshop told me about another “temporary autonomous zone” in Vancouver, four decades ago. That led me to a whole history of “seized spaces” in Vancouver, squatting and otherwise. Unfortunately, by the time I did all the research and interviews, Occupy Vancouver had ended, and the moment for the story had passed. As selling this story seems increasingly unlikely, I post it here free. Squatters evicted from All Seasons Park April 20 1972. 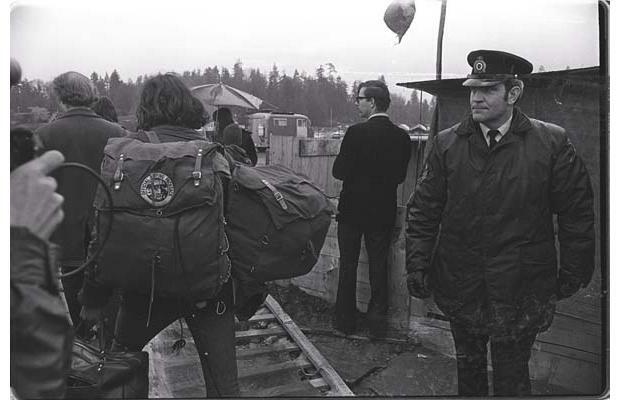 Just over forty years ago, Vancouver was home to another occupation, an ad hoc people’s park at the entrance of Stanley Park known as All Season’s Park that evolved into a tent city that lasted for months. What started all this was the Four Seasons company’s plan to build a complex on two blocks adjacent to Stanley Park, which would block the view of the harbour and the park. This was a highly controversial move, strongly supported by Mayor Tom Campbell and his city council, and strongly opposed by the park board. Shortly after the Save the Entrance to Stanley Park Committee took the city to court for the rezoning, a group of young people took direct action to save the land. Inspired by People’s Park in Berkeley, California which was founded two years before, a Vancouver-based group of Yippies (Youth International Party members) gathered on May 29th, 1971 on a patch of land just off Georgia Street. About seventy people knocked down the fence on Georgia. They dug holes, started a garden of potatoes and onions, planted maple trees and erected a sign that said, “All Seasons Park.” The police moved in and arrested nine people, but ultimately let the camp stay. Vancouver has its own history of squatting, people occupying territory in an unsanctioned way as political protests or just places to live. Stanley Park was home to a man named Tim Cummings, who was born there before it was a park. Affectionately known as “the squire of Stanley Park”, he rented three-quarters of an acre near Brockton Point from the park for $5 per month, and lived there in a house there nearly all of his life, until he had to move into a rest home in 1958 and died shortly thereafter. The city was more hostile towards the squatter communities around the city. In the 1930s and 40s, there were houseboats in False Creek, and shantytowns on the mud flats of the Fraser River around the south end of Main street. One report said the Main Street community had 23 unauthorized dwellings, housing 81 people (31 of them children), on 1.5 acres of land. The residents were mostly members of the Pacific Coast Fisherman’s Union, who fished in the river and sometimes clashed with the loggers who had to parked log booms at the same spot. There were reports of stolen boom chains and a squatter with a shotgun threatening a tugboat captain. On the south shore of Burrard Inlet, 48 people lived in 19 cabins on National Harbour Board property, some with electricity, telephone and running water. Businesses objected to squatters poaching water or electricity, interfering with business or occupying land that could be commercially developed, and the city made several attempts to destroy or relocate squats. In 1942, the Vancouver Fire Department had an authorized “arson party” to to burn seven abandoned houseboats. In 1948, a chambermaid came home from work one day and found her cabin near False Creek had been moved 100 feet. The city did declare a moratorium in 1944 on destruction of shantytowns because of wartime housing shortages, and prevented the eviction of 100 people living under the Georgia Viaduct by the Great Northern Railway. Despite all these efforts, unauthorized communities persisted. In the late 50s, the city still struggled to get rid of squatter communities, allegedly “hotbeds of crime and vice”, and demolished or removed over 250 shacks in a two-year campaign. Other cases of squatting were more political. Vancouver was hard hit by the Great Depression, and the federal government responded by building relief camps for what amounted to slave labour. On May 11, 1938, 1600 people occupied the post office (a federal building), the Vancouver art gallery (a provincial building) and the Hotel Georgia (a private business). This was the culmination of months of demonstrations by labour-socialist activists protesting the closing of work camps, city laws prohibiting “tin-canning” for money, and the removal of single men from relief rolls. While the hotel occupiers took $500 and left, the post office and art gallery occupations lasted more than a month, with the Mothers’ Council delivering food to the Operation Sit-Down Strikers. It came to an end on May 20th, when the Vancouver police and the RCMP used tear gas to clear out the two buildings and arrest the protesters. Mobs marched the streets, smashing windows at the police department and demanding the release of the prisoners. On the morning of September 21st, police stormed the building, leading to 58 arrests, all but one of which were released after signing an agreement not to re-enter the building. This led to several long term demonstrations in and around the building that lasted until December 2002. Woodsquat did have some influence over the provincial government’s decision to develop the site with some non-market housing after the building was demolished in 2006. “After the word got out it was there, people started to come and they got better organized. They started having meetings about rules,” says Sarti. “There was a rudimentary form of self-organization, quite similar to what’s happening in Occupy Vancouver. Not with a structure, but people meeting and discussing, ‘What are we going to do with garbage? How are we going to keep things from really getting out of hand? '” A company donated two pieces of heavy digging equipment, and the park quickly had latrines, bridges and benches. By late summer 1971, All Seasons Park was changing. Only about 40 of the 150 people on site were politically aware, and the remainder were just crashing. This split was visible in the camp’s layout. Reporters wrote about “a feeling of defeat” and called it “not the radical hotbed it is cracked up to be” and a “ghost park”. By February 1972, the plan to develop the land was dead. The squatters in All Seasons hung around until the spring of 1972. In late April, the Vancouver Port Authority ordered the roughly 30 squatters left on the land to leave, and demolished the shacks and huts with heavy equipment. A small group of young people barricaded themselves and their dogs inside a shack, where they sang O Canada and chanted slogans against “the pigs.” They remained there until the Port Authority police forced their way into the shack and dismantled it. One of the holdouts, a 17-year-old woman from Calgary, had to be taken to a hospital with a burning fever. A family of four who had been living in a truck in the park also had to leave, even before their oldest daughter came home from school. A couple of days later, the protesters planted a 65-foot fir tree. In August 1972, Four Seasons Hotels quietly withdrew from the project. I was there! A small group of us went in the night before and loosened the supports on the fence. I lived in the lean-to with the red cross painted on the side. I would very much like to connect with other people who were there. Is there a board somewhere? And for the Record… The tree was planted early during the first summer and not after the demolition. And for the Record #2… Check the front page of the Georgia Straight from about two weeks before Four Seasons pulled the project for the “straw that broke the camel’s back”. Again, I was there. I took the pictures. Hey Butch.. Yes we were there. I sure hope you get this message. What happened to the 65 foot fir tree? Did any of the maple trees survive? Brad, the tree was a windfall they picked up up the coast. It didn’t root well and it would not have survived. I helped carry that tree to the middle of the lot roots and all and plant it. They made the site into a hurtin little park now.